I had planned to hike the 11 mile section of Mainline Tunxis trail with my friend Rob Y – but awoke with a sick wife and child. (Note: here’s the Mainline section through this area.) So that was a no-go. When said sick son conked out an hour early for his midday nap and said sick wife was curled up in bed with a book, I realized I had a good three hours of “free” time. Quick! 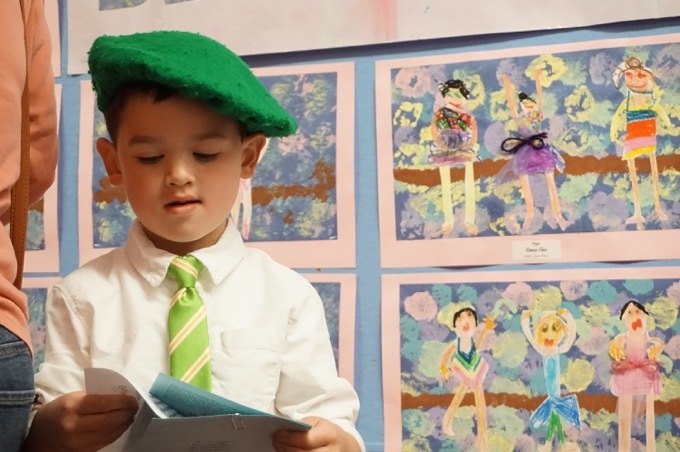 To the CFPA Walk Book! Aha! There’s a 6 mile smattering of trails in the Tunxis system not too far from home. Quick! On with the hiking pants and moisture-wicking shirts! Quick! Pack up an energy bar and a banana and some water! Quick! Time’s a tickin’! Oops, forgot liner socks and my microspikes in case of residual ice and snow deep in the woods. Oh well, no big deal – let’s drive west! I sped out to and parked at… SATAN’S KINGDOM – dunh-dunh-DUNNNNHHH! The (relatively) undeveloped area of Eastern New Hartford is officially called Satan’s Kingdom. 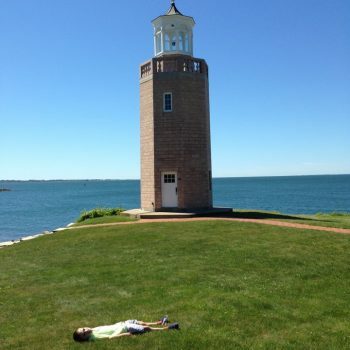 For an explanation (and to view another list of things to find in Connecticut, check this out. For a Puritanical original colony, Connecticut sure has a lot of these demonic place names. I parked in the lot along the Farmington River used by all sorts of river tubers and canoeists in the warmer months. In mid-March, my car was lonely. Why did I spend so much time above yapping about stuff that really isn’t about the trails in question? Because the trails in question are, to put it bluntly, questionable. 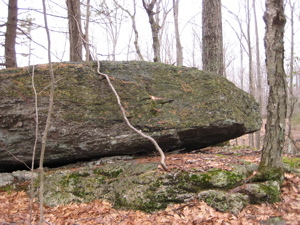 Take, for instance, the Tipping Rock Loop – an icky little trail through a managed forest (read: felled hemlocks) with an epynomous rock that no longer tips as the name would suggest. 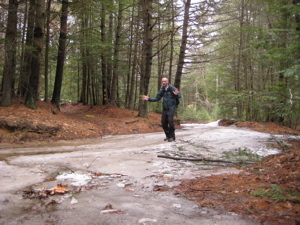 But before I got to that point, I had to contend with patches of snow and ice that I really didn’t expect. Fortunately, I was able to essentially run over these stretches with success. There was one cool point with a very high rock wall off to my right and a rare middle-of-the woods designated camping spot, but other than that, there was not much. 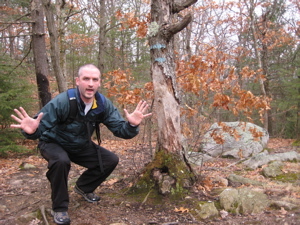 After just under a mile or so, I reached Tipping Rock. Or, more accurately, “The Rock Formerly Named Tipping.” Apparently, up until 50 years ago, this four-foot high glacial erratic actually did tip back and forth. And yes, it’s cool that it’s on top of a massive cliff/boulder… But today? Today it’s just a rock sitting amid other rocks. I climbed up to it, touched it, pretended it rocked, and picked my way back down to the trail. 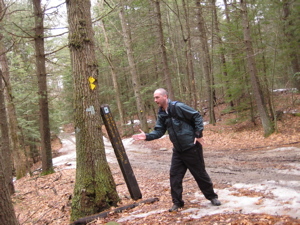 It was here that the 2nd trail in the Nepaug Region begins – the Valley Outlook Trail. 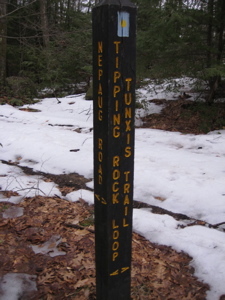 I went off to hike that out and back, but hold on – let’s finish with the (No Longer) Tipping Rock Loop. The Department of Environmental Protection (DEP) Environmental Conservation (EnCon) Police are investigating a fatal motor vehicle accident that occurred last night, November 12, 2006 in Nepaug State Forest. The driver of the vehicle, Nicholas DePaola, age 17 of Canton was pronounced dead at the scene. The victim was operating a 1998 Jeep Cherokee on a dirt road in the Nepaug State Forest when he apparently lost control of the vehicle and it struck a tree. Connecticut State Police responded and notified DEP at approximately 5:00 PM. The driver was the only occupant of the vehicle. The New Hartford Fire Department Emergency Services, Connecticut State Police and the Canton Police Department assisted DEP on scene. Update: Vehicular traffic is now illegal in the Nepaug State Forest. Spur trails are always annoying to me. They are dead-ends which means that you must hike it twice which I just don’t really like. If I can, I will usually bush-whack to not have to back track, but in some cases, there is no choice. 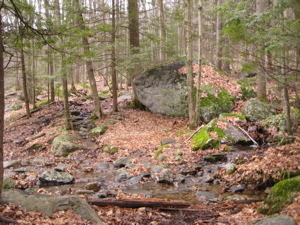 This is such a trail (if, that is, you want to complete the whole Tipping Rock Loop. You can cut across the woods and miss a bit of that trail if you so desire. 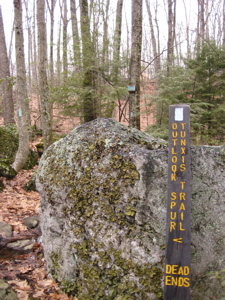 This trail swings north and passes by the back of Tipping Rock then steeply up something called Queen Mary ledge. Swing back southwest and follow the ridgeline for the mile or so. 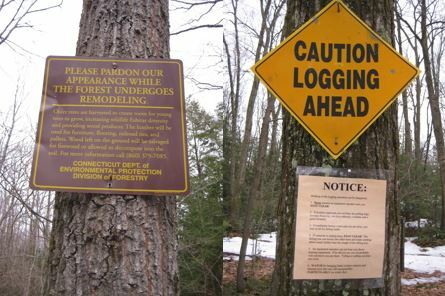 There were a few ups and downs over several knolls and some still-standing hemlock stands. There were some really nice sections here where I felt truly isolated. 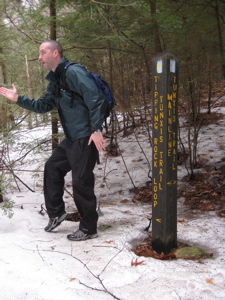 And, in a sense, I really was – out here alone in the Nepaug Forest on a dead-end trail. And to me, this was a good thing! I had hoped that the reward at the end would satisfy me. It’s a nice view. Not the best, not the worst. This view, randomly called the Rome Spare Outlook, which according to the Walk Book takes in the Nepaug Valley and Yellow Mountain. Since I had the mile return hike (which I pretty much jogged the whole of), it gives me a good place to give a little background on this State Forest, courtesy of the state’s DEEP website. 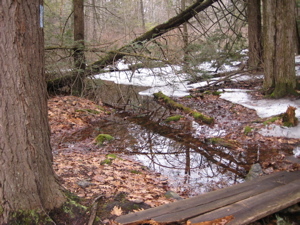 Nepaug State Forest was originally established to protect the streams feeding the State Fish Hatchery in Burlington. The acquisitions in this area were known as the Burlington Block. In 1927, additional acquisitions were made to the north, in what became known as the Satan’s Kingdom Block of Nepaug Forest. In 1942, it was decided to create two forests. 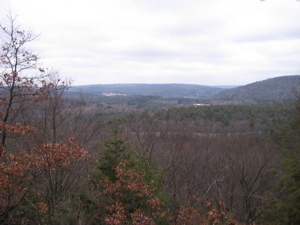 The southern Burlington Block became Nassahegon State Forest while the northern Satan’s Kingdom Block became Nepaug State Forest. Recent acquisitions have brought the size of Nepaug to 1,374 acres. 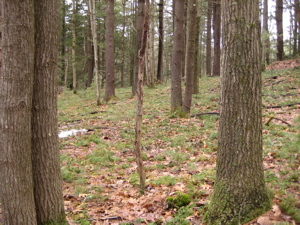 The majority of the forest is found in New Hartford, with only a few acres being in Canton. The forest is managed for sawtimber, firewood, wildlife habitat, and recreational activities such as hiking, hunting, fishing, canoeing, tubing, and bird watching. After completing the previous trail, I turned north up the Tunxis Mainline trail along the – oh you know what road it is – – dunh-dunh-DUNNNNNNHHH! – for a third of a mile or so to the junction with this oddly named short little loop trail. 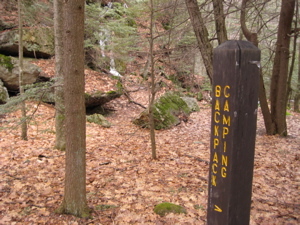 Just off the Mainline trail, this side trail just sort of “is.” It descends through the forest along a little stream down towards the Farmington River. I never saw any shelter, let alone four of them. The trail follows yet another “road” called Bampton Road which I refuse to believe is anything more than an ATV can traverse. 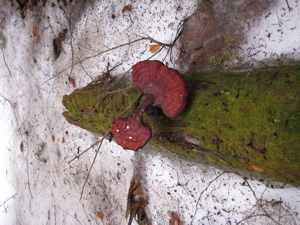 The trail here was also covered in snow and ice – far more than not. I just ran and slid and slipped my way down the little valley. 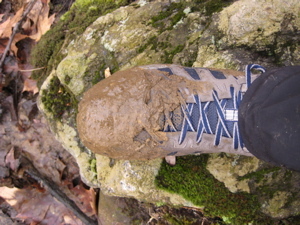 At this point, since I had stepped through so much snow and ice my shoes and socks were wet. I was getting some fairly nasty blisters as a result. I chalk it up to SATAN and his road. I’m not sure what else there is to say about the Shelter 4 Loop. 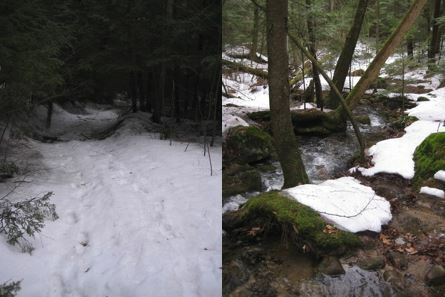 Um… There are definitely some very pretty little spots scenes of mountain streams gurgling through snowy pines. Which is good enough for me. I’d wager that this little side trail is actually a better walk than the Mainline trail which merely slogs along… SATAN’S KINGDOM ROAD! Thanks for a candid review of the area. 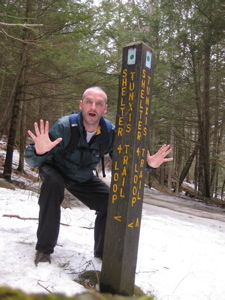 Nice Video–I do plan to hike these trails when its a little warmer! Thanks for the info.